Support voice control: Compatible with Amazon Echo, Echo Dot, Amazon Tap, etc. manage your device through voice control. You can remotely control the smart light bulb: You can DIY your color led light bulb. When you are not at home, remotely control your lighting. Color settings: Personalize your lights, color palette over 16 million colors and different shades of white light, and each color is adjustable. A variety of lighting modes, suitable for various occasions. [Support voice control]Work with Amazon Echoã€Echo Dotã€Amazon Tap: Voice Control your wifi bulb dimmable. 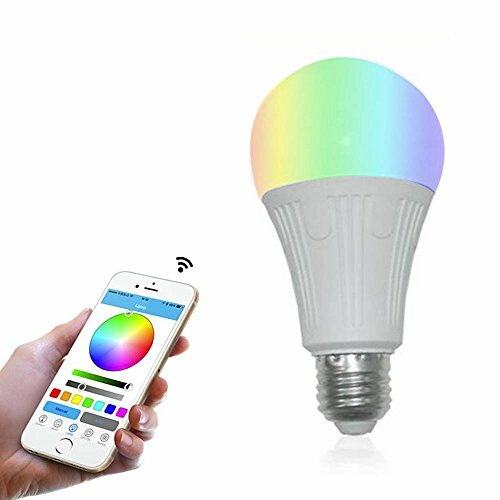 [Multicolor feature]Wifi smart bulb has over 16 million different colors and different shades of white light,Setting your own color and brightness, meet your different needs. [WiFi light bulb]You can DIY your smart light bulb. When you are not at home, remotely control your lighting. [Application]:This is WiFi enabled light bulb, no hub required. Multiple lighting pattern, suitable for showcase, residential, office, hotel, shop,landscaping, indoor, home etc. [Warranty]Our Customer Satisfaction Money-Back Guarantee: If you are not satisfied with the wifi led light bulb just return them within 30 days for a full refund.